It’s important to avoid the chewy and sticky foods such as caramel, taffy, and gum. These foods can get stuck in your braces and may even break them or pull them loose. You should also avoid hard and crunchy foods like nuts, chips, ice, and hard candy. These foods can bend wires or break brackets. Popcorn can get stuck in your braces and camage your gums. Eating apples and carrots is great, but you should cut them into small pieces rather than biting into them whole, which can break your brackets loose. Nutritious foods like dairy, bread, meat, poultry, seafood and vegetables are also great. Just make sure they’re prepared in a way that’s easy to chew. Cold, soft foods such as ice cream, yogurt, and apple sauce are great to eat if your teeth get sore. Brushing and flossing is especially important when you have braces. Normally, your tongue, lips, and cheeks can wipe the food off of your teeth after you eat. When you have braces, however, this just doesn’t work. Food and plaque get stuck to your teeth around your braces and the only way to get them clean is with a toothbrush. You should brush your teeth every time you eat something, which means you should be brushing at least three times a day. Be sure to bring a toothbrush with you to school or work so you can brush after lunch. We recommend you use toothpaste with fluoride to prevent white spots and cavities. Mouthrinse with fluoride can also help prevent white spots. Flossing with braces is tricky and takes a little extra time, but it is very important. You should floss at least once a day. You can use floss threaders to help you get the floss between the wire and your gums. You can also try using the Platypus, which holds a small segment of floss and can fit between your teeth and the wires of your braces. If you participate in athletic activities, you will need to wear a mouthguard to protect your mouth, your teeth, and your braces. Mouthguards are especially necessary in high-contact sports. Let us know if you play sports and we’ll be happy to give you a special mouthguard that is made to be used with braces. Other types of mouthguards should not be worn as they may not accomidate braces or tooth movement. If an accident does occur during play, immediately check your mouth for injuries and damage to your braces. Contact us as soon as possible so we can take care of any problems. When your braces are first placed, it is normal for your teeth to get a little sore as they start moving. We recommend taking over-the-counter pain relievers to help with the initial soreness. It is also normal to get sore spots on the inside of your lips and cheeks if the braces are rubbing on them. 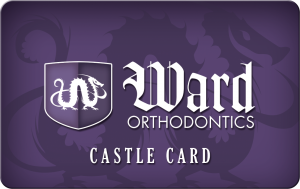 If a sore spot develops, place a small piece of ortho wax over the bracket that is causing the sore spot. This reduces the friction and allows the sore spot to heal. Rinsing your mouth with saline solution (1 teaspoon of salt in 8 ounces of lukewarm water) can also relieve the discomfort. You may notice that your teeth start to feel slightly loose. This is also normal. Your teeth loosen slightly as they are aligned by your braces. Once they are in their proper position they will stabilize with time. You should occasionally check the wires and bands on your braces and contact us immediately if anything is loose or broken. As a temporary solution you can use the back of a spoon or even the eraser on a pencil to gently push back the loose wire. If one of the parts actually comes off, be sure to keep it and bring it to your next appointment. A loose wire may cause irritation. Use ortho wax or just a small cotton ball to cover it up and keep it from poking you. Doing your part to keep your teeth and gums healthy and maintain your braces will help insure that your treatment is completed on time. Bad oral hygiene and damaged braces may prolong the overall treatment time.